The Moms Co. Tea for acidity relief is an all natural and Caffeine free herbal blend of Chamomile Flowers, Lemon Balm, Peppermint Leaves and Blackcurrant Leaves that helps ease heartburn and calms the digestive system. 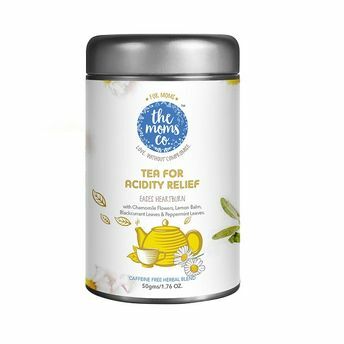 This herbal and organic tea is created by and imported from expert formulators in Europe, with the best natural ingredients, for moms and moms-to-be. It is best suited for pregnancy, post-pregnancy, new moms and anyone looking for Acidity Relief, Heartburn Relief, Indigestion or Nausea.